Meeting Community Needs in Minnesota: Last year more than 14,500 Americans of all ages and backgrounds met local needs, strengthened communities, and expanded economic opportunity through national service in Minnesota. The Corporation for National and Community Service (CNCS) invested more than $41.2 million to support cost-effective community solutions, working hand in hand with local partners to empower citizens to solve problems. AmeriCorps members and Senior Corps volunteers are preparing today's students for tomorrow's jobs, reducing crime and reviving cities, connecting veterans to services, fighting the opioid epidemic, helping seniors live independently, and rebuilding communities after disasters. Service members served at more than 2,600 locations across Minnesota, including schools, food banks, homeless shelters, health clinics, youth centers, veterans facilities, and other nonprofit and faith-based organizations. Through a unique public-private partnership, CNCS, its grantees, and project sponsors generated more than $37.7 million in outside resources from businesses, foundations, public agencies, and other sources in FY 2017. This local support strengthened community impact and increased the return on taxpayer dollars. AmeriCorps State & National engages men and women in intensive service at thousands of locations across the country through nonprofits, schools, public agencies, tribes, and community and faith-based groups. 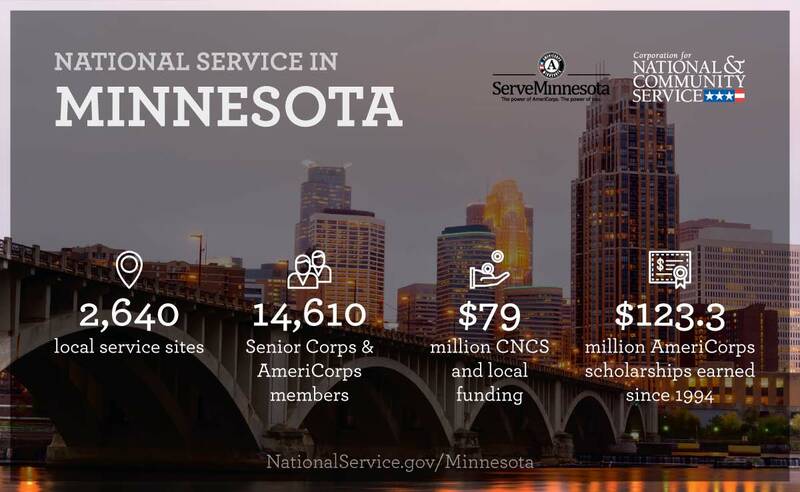 Most AmeriCorps grant funding goes to ServeMinnesota, the Governor-appointed State Service Commission, which in turn awards grants to organizations to respond to local needs.